The Regional Meeting gathered a wide range of participants and began with opening remarks followed by a discussion on policy recommendations and regional priorities for the New Urban Agenda. At the opening, the Coordinating Minister of Maritime and Resources Affairs of the Republic of Indonesia, Dr. Rizal Ramli, stressed the importance of formulating the New Urban Agenda to achieve sustainable urban development. He commented on the power of cities to pursue both economically viable and sustainable policies that engage all levels of the urban community. Taufik Widjoyono, the Secretary General of the Ministry of Public Works and Housing of the Republic of Indonesia emphasized the valuable role of urban stakeholders, the youth and technology in the New Urban Agenda. The Secretary-General of the United Nations Conference on Housing and Sustainable Urban Development (Habitat III), Dr. Joan Clos, highlighted the fact that good urbanization does not come by chance, emphasizing that cities can be transformed through knowledge and cooperation. Dr. Shamshad Akhtar, Executive Secretary of United Nations Economic and Social Commission for Asia and the Pacific, emphasized the global significance of urbanization in Asia and the Pacific noting that “what happens in the Asia-Pacific region has critical implications for the planet”. Following the opening, the high level panel discussion on “Rethinking Today’s Practice in Urban Development” brought sub-regional perspectives to attention. The Solomon Islands Minister of Land, Housing and Survey, Andrew Manepora’a, gave his reflections from the Pacific. From the Philippines, Secretary General of Housing and Urban Development Coordination Council, Philippines, Cecilia Alba stressed the importance of regional collaboration, while Indian Secretary of Housing and Urban Poverty Alleviation, Nandita Chatterjee, called for action on sustainability and good governance. Dr Joan Clos, Secretary-General of the Conference, delivering opening remarks at the Regional Meeting. Following the high level panel discussion, a series of side events were held in parallel on a range of relevant urban development topics. Urban stakeholders including the United Nations Human Settlements Programme (UN-Habitat), United Nations Environment Programme (UNEP), General Assembly of Partners, UN Major Group for Children and Youth, Huairou Commission, United Cities and Local Government (UCLG), and more hosted the side events and brought a wide audience to discuss critical issues including the voices of urban youth, gender equality in local governance and integrating the SDG’s in the New Urban Agenda. Day two of the Regional Meeting began with country and regional stakeholder statements on the challenges of urbanization and their inputs and recommendations for the new New Urban Agenda. Asia Pacific countries that gave statements included Afghanistan, Bangladesh, Bhutan, Cambodia, India, Indonesia, Japan, Kiribati, Lao, Myanmar, Nepal, Pakistan, Philippines, Papua New Guinea, Solomon Islands, East Timor and Vietnam. Ecuador, the host country of the 2016 Habitat III conference, also provided a statement. Major group statements were made by Asia Pacific Regional CSO Engagement Mechanism (AP-RCEM), the Children and Youth Partner Constituent Group of the General Assembly of Partners, The International Society of City and Regional Planners (ISOCARP), and the Organization for Economic Co-operation and Development (OECD). The recommendations that were presented varied from supporting good governance and strong institutions, to recognizing the urgency of mitigating Climate Change in the Pacific Islands, to emphasizing participatory mechanisms throughout Asia and the Pacific. Sayed Sadat Mansoor Naderi, Minister of Urban Development Affairs of the Islamic Republic of Afghanistan, mentioned the importance of addressing the unique needs of Less Developed Countries (LDCs) and the importance of ensuring sustainable financing for urban infrastructure, noting that LDC’s are “usually the ones urbanizing the fastest, and almost always the ones with fewest resources.” Cecilia Alba from the Housing and Urban Development Coordinating Council of the Philippines noted the challenges of urban mobility in large urban metropolises, emphasizing the Philippine’s commitment to developing strategies and implementing plans for urban mobility that will also address social inclusion, reduce pollution and enhance the economy. Mr. Sajjad Ahmad, Joint Secretary, Ministry of Climate Change of Pakistan stated that in the New Urban Agenda, Pakistan must focus on developing the “third tier of government empowered with adequate administrative and financial authorities, streamlining coordination between different land controlling agencies for integrated planning and development of cities”. Ministers and other national representatives from throughout Asia and the Pacific emphasized their country’s’ unique urban circumstances, reaffirming their commitments to Habitat III and to participating in the inclusive process leading up to Quito. Additionally, Regional Stakeholders provided valuable perspectives on key issues in the region. Following the statements, Ms. Sri Husnaini Sofjan from the Huariou Commission facilitated a high level panel discussion on “Planning ahead the New Urban Agenda”. Mr. Beng Hong Soechat Khermo of Cambodia’s Ministry of Land Management described Cambodia’s “Public Private People Partnership” program for housing, which is intended to create joint development plans across sectors with various stakeholders. Dr. Joan Clos, Secretary General for the UN Conference on Housing and Sustainable Urban Development emphasized the importance of addressing increasing inequalities in urban areas and developing a new global architecture for international finance. Following the dynamic high level panel, member states presented the final declaration of the two-day event. 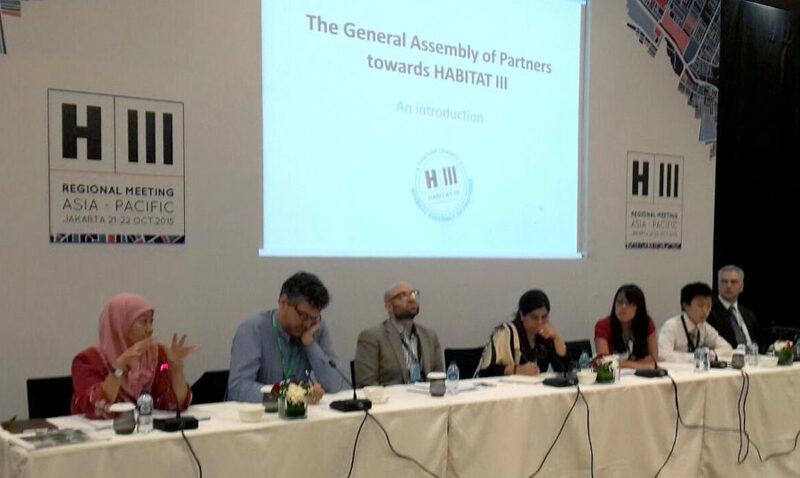 The Jakarta Declaration developed during the Habitat III Asia-Pacific Regional Meeting gathered recommendations and reflected the consensus reached at the regional level on the entire spectrum of proposed inputs for the New Urban Agenda. In the Jakarta Declaration, member states recognized the “unique, diverse and rich history” of the region, advocated for a “radical shift in the way cities are planned, developed and managed”, and urged renewed strategies towards disaster resilience, the informal sector, fostering historical and cultural heritage and more.